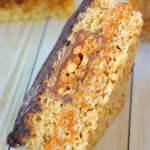 Everything you love in the classic SNICKERS® candy bar made into a delicious no-bake dessert! These easy cheesecake cups are fantastic for parties, especially home-gating, tailgating and perfect for watching the big game! Are you watching the big game at your house this year? Maybe getting together with friends and family to enjoy some great food and drink along with the best game of the year? 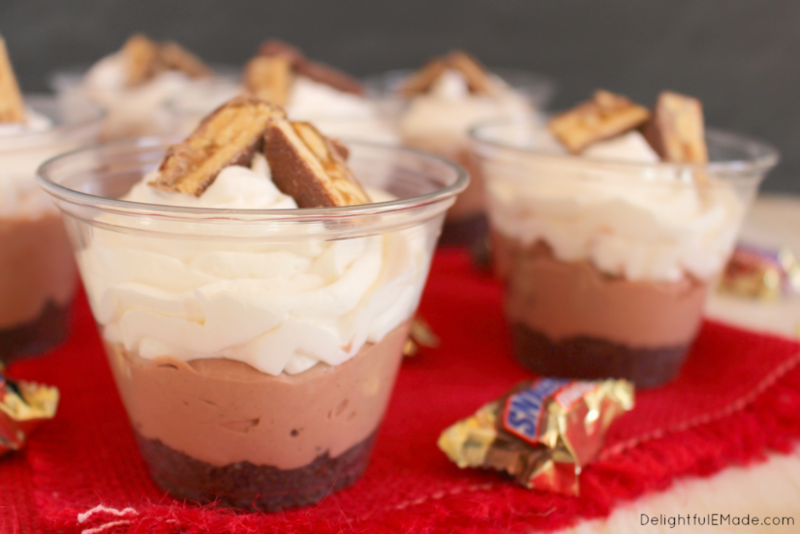 I’ve got the perfect dessert for feeding your hungry crowd – these super yummy SNICKERS® No-Bake Cheesecake Cups. Anytime you get folks together to watch the big game, you always need lots of food to celebrate! Don’t forget the sweet stuff! 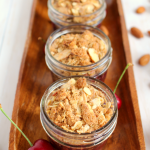 Everyone loves a great dessert, especially one as delicious as this. I love making little cheesecake cups for parties – not only are they easy to make, but since they’re single-serve, your guests can grab them whenever they want. As the host, you don’t need to worry about slicing and serving up something – these cups are PERFECT for a party and allow you to kick back and enjoy the game as well! 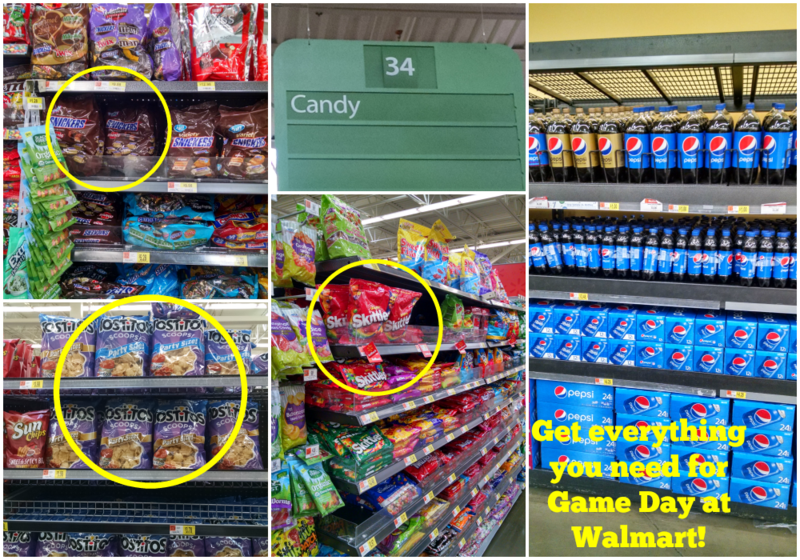 The first place I always stop for my big game essentials is Walmart! 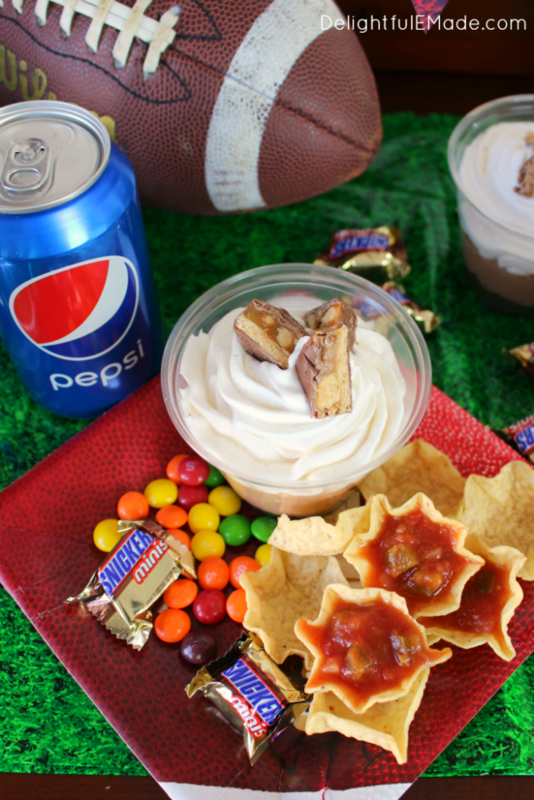 Not only do they have all the ingredients for my cheesecake cups, but they have everything for a home-gating party like Pepsi™, Skittles®, TOSTITOS® Scoops Party Size, TOSTITOS® Medium Chunky Salsa, and of course the big party-sized bags of the SNICKERS® Minis. These big bags are perfect for parties, as you know you’ll have lots to feed your hungry crowd! 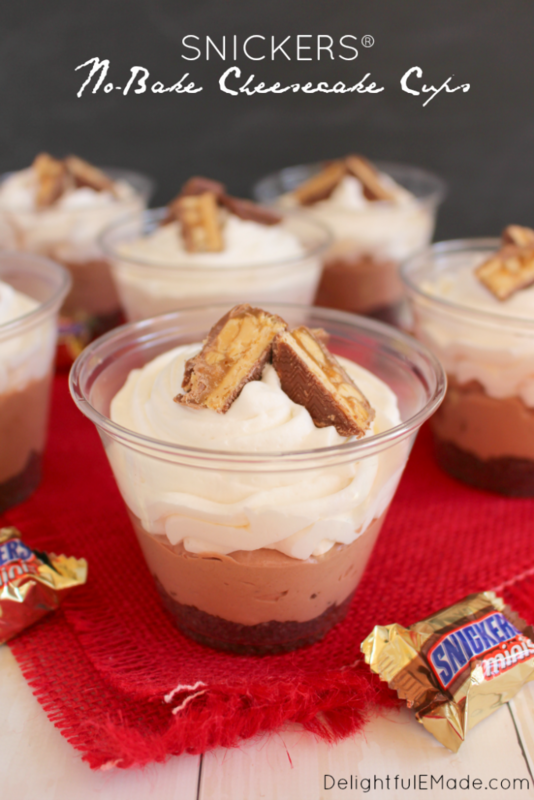 These SNICKERS® No-Bake Cheesecake Cups are a cinch to make, and great to make ahead of time before your big party. Since these are no-bake, there are just a few simple steps to getting these awesome dessert cups. First, start with the crust – you’ll combine chocolate graham cracker crumbs, melted butter and sugar, and then press the crust into the bottom of the cups. Once the crust is complete, you can then start the filling. You’ll combine cream cheese, and sugar, along with chocolate pudding mix and milk, to get a super creamy, chocolate cheesecake mixture. Then, fold in a container of thawed frozen whipped topping and the SNICKERS® pieces. Then, spoon the filling into the cups. Refrigerate for at least a couple hours or over night. I like to make these the night before the party, and then top with the extra whipped topping and SNICKERS® just before setting out on my buffet table. Check out the cool set-up I put together for game day! 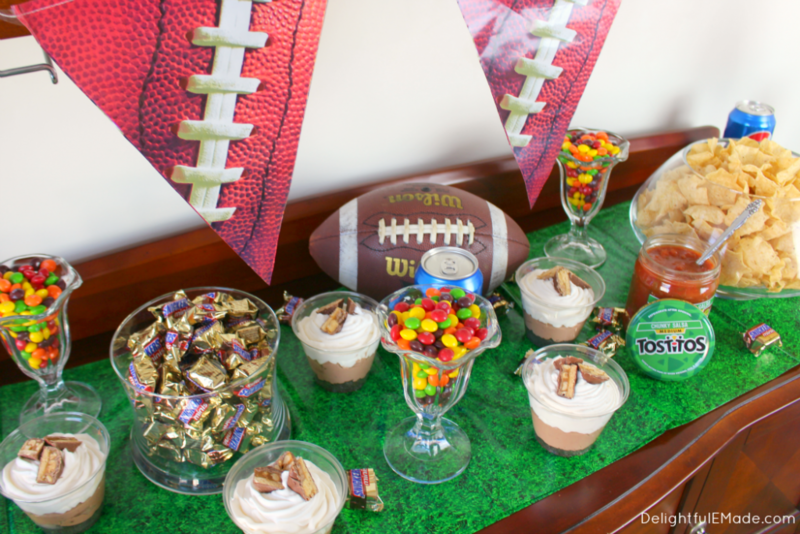 To put together this fun, and easy football themed buffet table, simply grab a few decorations, and then set out all of your goodies you scored at Walmart! 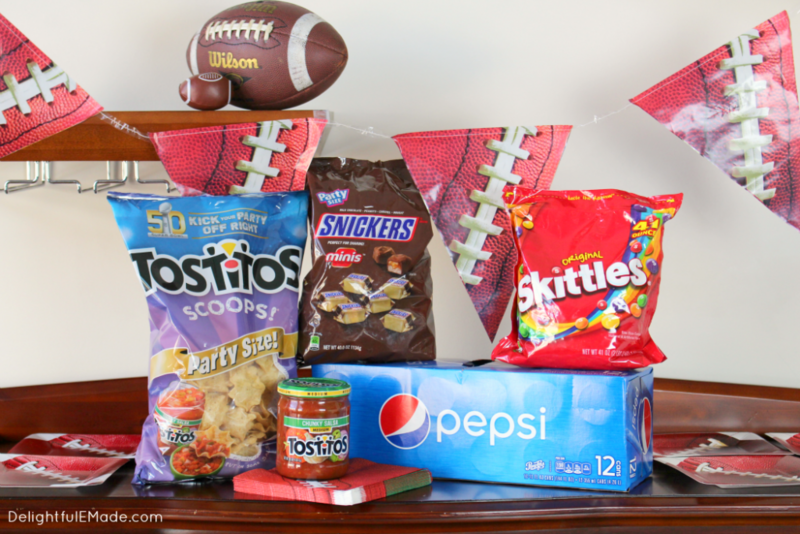 It’s such a fun way to celebrate with family and friends, and they’ll love the fact that everything is ready to grab for game time! 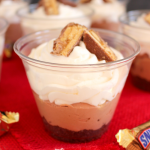 These awesome SNICKERS® No-Bake Cheesecake Cups are a really fun addition to any game-day spread! 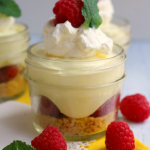 Everyone loves something sweet, and these cheesecake cups will certainly be no exception! Everything you love in the classic SNICKERS® candy bar made into a delicious no-bake dessert! These easy cheesecake cups are perfect for parties, especially home-gating, tailgating and perfect for watching the big game! In a food processor or blender, crush about 9-10 sheets of the chocolate graham crackers. (This will equate to about 1 1/2 c. of crumbs.) To the crumbs, add the melted butter and sugar. Stir with a fork to incorporate. To clear plastic cups (small mason jars work well also), add about 3 Tbsp. of the crumb mixture. Press into the bottom of the cups firmly. Set the cups aside. 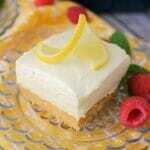 With a hand or stand mixer, add the cream cheese and sugar, and cream together until smooth. 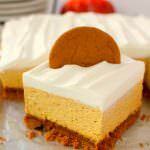 In a separate container, whisk together the milk and pudding mix and pour into the cream cheese mixture. Mix these together until fully incorporated. Fold in the container of whipped topping, and lastly, fold in the SNICKERS® pieces. 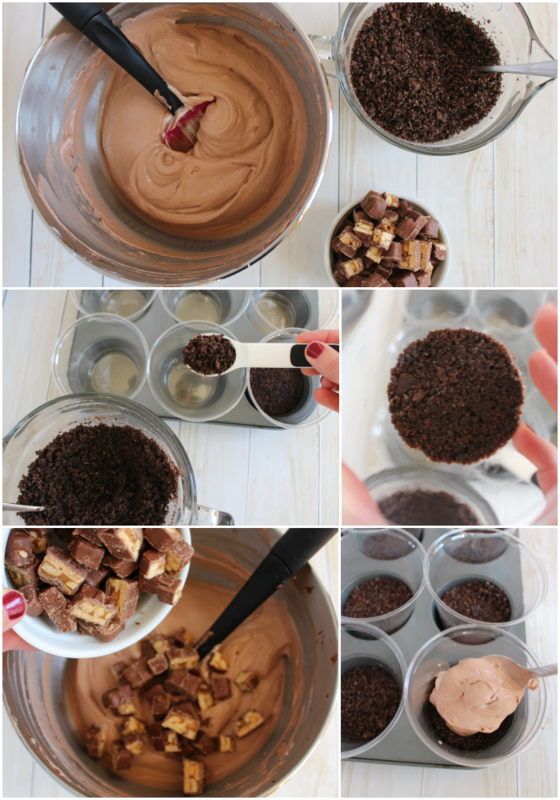 Evenly spoon the chocolate filling into the cups, and refrigerate for at least 2 hours or overnight. Just before serving top with additional whipped topping and SNICKERS® pieces for garnish. Do you have a go-to game day recipe that you love? Let me know your fun traditions and favorite dishes in the comments below! 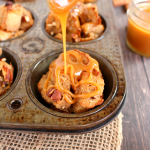 Here are some really awesome game-day ideas that you and your family are sure to love! Wow, these look amazing! All of my favorite things in one! I love that they're single serve!